Grand Theft Auto 4, a pure piece of gaming art! Rockstar once again have made an instant classic game, ignore the bad press out there, stupid people doing stupid things and its all getting blamed on a game, not the stupidity of those individuals! 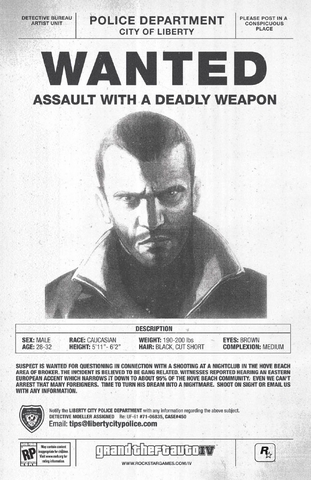 GTA 4 takes place in Liberty City, you play Niko Bellic, an East European immigrant with a dark past. You arrive in Liberty City fleeing your past and in pursuit of the “American Dream”, made even more tempting by the endless lies of your cousin Roman. Graphically the game is stunning, an entire rendered city finds you deeply immersed and addicted.Â The story moves at a good pace, and runs for almost 40 hours of play, and that doesn’t include times when you just wanna wander around doing other things of little consequence to the story-line.Â As with most next-gen game, GTA 4 brings a multiplay option, a painfully fun ability to run riot around the city either gunning down people, or my personal favourite, using a helicopter blades to cut your enemies into little pieces! Ok, it is a violent game, with very mature adult themes, but it DOES state this on the game box, and its 18 certificate is a massive warning sign to parents thinking of purchasing this for ‘lil Tims 8th birthday or something. Both myself and Dave are very addicted to this game, and even found ourselves playing through the story mode while chatting on xbox voice about it! If you’re over 18, and have either a PS3 or Xbox360, then you should grab a copy now.Â Over 6 million copies sold already, and I bet none of those gamers are disappointed in what they got.